Sunday, March 2nd @ 8pm The Riverside Theater you will find the show Rain. As I write this post, The Beatles are playing on the radio. 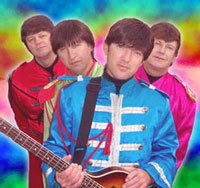 Ok, I don't want to seem jaded, but here goes: If you put on mop top wigs you are not The Beatles. If you put on marching band uniforms and round wire rim glasses, you are not The Beatles. If you play their songs note for note, broadcast video footage, have pretty lights, etc...you are still not The Beatles. I'm not a huge nostalgia fan. Don't get me wrong, I love seeing old bands. They have to be the real thing though. I have seen Gary Numan play many times. His only hit in America was back in 1981. Still, I'm watching Gary Numan, not some guy dressed up like Gary Numan. Same goes for Emerson, Lake, and Palmer. When the band "3" played at Billy's Old Mill, I was watching Keith Emerson, and Carl Palmer. Sorry you Beatles fans, I just can't accept this event. Once you put fakes up on a stage, you have lost me. To quote Mark Lewis of Rain " The five members of Rain, each a huge Beatle fan himself, use the Beatles' albums like textbooks, constantly referring to them to ensure the songs performed live include every harmony, vocal tone, chord inversion, hand clap, cowbell, string arrangement - even possible good. That's why Rain's music meets the expectations of audiences who know the Beatles' music subconsciously." If the members of Rain were good enough to impress Beatles fans with their renditions of the real Beatles without the wigs and lights, then I would give them their due. If the musicians were actually themselves, not dressed up as a look-alike AND sound-alike band, I would have no problem with Rain. This picture isn't Rain, but you get my point. Looking back is fine. Living in the past is not fine.